Often referred to as “The Peninsula,” Point Loma is a 4 mile peninsula located at the entrance of the San Diego Bay. Point Loma is bordered on the west and south by the Pacific Ocean, to the east by the San Diego Bay and the north by the San Diego River. This area is condsidered one of the nicest and most beautiful beach communities in all of San Diego County. Because of this many of the Point Loma houses for sale sell well over a millon dollars. The average Point Loma house for sale in 2013 is approximately $1,600,000 and has ocean and bay views. Homes in Point Loma typically have views of the ocean, canyon and bay. The roads wind around the landscape, dotting many different and eclectic styles of homes. Many Point Loma homes are upscale and have been around since the 20's. Most of the homes were built between 1950 and 1980. Upscale areas include Silvergate and La Playa. These homes are large, many have views, and each house has an individual charm. 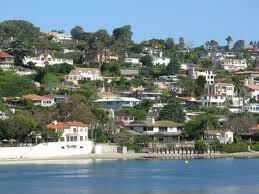 A popular subdivision is Shelter Island, a man made peninsula on San Diego Bay. This is the home of the San Diego Yacht Club, host to the America’s Cup as well as several marinas, hotels and restaurants. You can take fishing and whale watching trips from here. Other activities include boating, water sports and surfing along Sunset Cliffs. There are parks and trails along the coast and within the canyon with breathtaking views. Downtown is only just minutes to the south. This Oceanside community is also home to Point Loma Nazarene University. There are several distinct neighborhoods in the Point Loma. The commercial and heart of the peninsula is called Point Loma Village. Blocks away from the village is Shelter Island - a very popular spot for tourists and residents. The newest area is Liberty Station. Other area include the Midway, La Playa, Sunset Cliffs, Roseville and Loma Portal. See some of the available houses in Point Loma below.